The future Kohler 20KW was on display at the KBIS Show in Orlando FL, below is a clip with Ed DelGrande, highlighting the enclosure changes to potential customers. More in depth information will be available in the future highlighting other improvements including service access in the field. The best days are always ahead. from 8 to 150 kW between January 15 and December 31, 2018. You made a great choice when you bought a KOHLER generator for your home or small business. Now, if a friend buys one, you’ll get a $100 mail-in rebate. Recommend a KOHLER generator to a friend or family member. After he or she purchases it, fill out the rebate form and send it in along with the invoices. You’ll get a $100 rebate. To learn more about this program, contact South Shore Generator. With almost a century of engineering know-how behind it, our G-Drive engines are built with an eye on the future – designed to last for decades to come. KOHLER engineers, tests and fits every single component. And our computer-aided quality-management system oversees every step of development, from the first stage of production through the engine’s entire lifecycle, to ensure the highest level of quality. Created specifically for generator set applications, our G-Drive engines combine greater power with superior efficiency. Reaching up to 43.5 kW/liter, KOHLER® G-Drive engines pair a compact engine form factor with unrivaled kW displacement—delivering the highest power density on the market*. All KOHLER generators meet tough industry testing and quality standards (UL2200, CSA, NFPA). The KOHLER G-Drive diesel engine’s architecture, injection system and engine management have been designed to achieve optimal generator set performance. The common rail fuel system generates up to 2200-bar injection pressures for maximum efficiency, optimizing the combustion pressure curve through multiple injections. This produces industry-leading kW displacement in a package that enables a smaller generator set footprint while delivering the best fuel consumption at more nodes than any competitor between 800 kW and 2500 kW. A modular system allows us to scale the number of components depending on the power required. Using standard components means fewer parts must be stocked in the field, and operators require less training. This reduces costs and improves response time. KD Series generators feature integrated controls for seamless communication and offer remote monitoring through a VPN connection. Easy-access bearing lube points, coolant level optical gauges on both circuits and oil replenishment systems help ensure the generator runs optimally and is easy to maintain. For more information on industrial generators, contact South Shore Generator. When mariners gather for a discussion about all things boating, a topic that often comes up relates to generators. The generator discussion usually reveals some level of confusion among participants. Some are confused about how powerful their generators should be for their type of boating. Others have concerns about noise and fuel consumption, while still others are concerned about pollution. All of these concerns are legitimate. Like any other piece of boating equipment, the choice of size and type of generator depends on how it is to be used. If the plan is to take it to the beach to provide power for a sound system or to keep the drinks cold, any number of small, portable gasoline units weighing as little as 50 pounds are available. 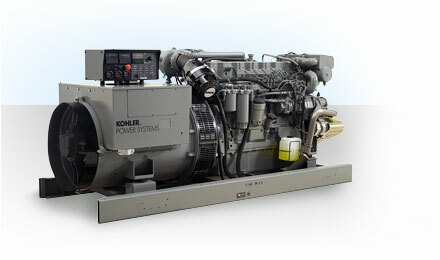 There are many well-built players in the marine generator market. Research—an indispensable boating skill—will help locate and price these units in any skipper’s local area. Many of these small units are as quiet as the inside of a library—about 60 decibels—and they are so light and small they can easily be carried on all but the smallest boats. Many small boats have them on board as a safety item to provide emergency battery charging, since almost all of them are capable of producing direct current (DC). If the generator is going to be used to power tools that are part of a vessel’s repair or maintenance system—such as a welding machine on a metal boat—the smaller portable units will generally not do the job. Any generator with an output of at least 5kW will be required if it is to be used as part of the repair and maintenance system of the boat, and it will not produce enough power to run all repair tools at the same time. However, it is perfectly adequate if the person doing the repairs is prepared to use one, or at the most, two power tools at the same time. A generator of 12.5kW will produce the same power as is usually found in a small land-based home or condo and will generally enable all normal and regular electrical equipment to be operated at once. Larger boats, particularly those equipped with multiple chillers for air conditioning, or electric stoves, ovens, and refrigeration, should be looking at generators capable of producing 15-20kW. In the past, smaller boats in the 25 to 30-foot range were simply not big enough to be able to carry the weight of an onboard built-in generator system. Similarly, gasoline-powered boats could not have onboard generators due to safety concerns because of gas fumes. However, in recent years a number of small diesel-powered generators have made their way onto the market. Some of them are referred to as “ignition proof” in that their operation will not trigger a gas fume explosion if installed in older gasoline-powered boats. They also have the advantage of being relatively lightweight. Many produce small output, diesel-powered generators in the 2.6 to 4kW range that are useful in even the smallest vessels. Not only do these smaller units provide power for 110V AC tools and equipment, they can keep batteries topped up through various available battery chargers. With the ever-increasing availability of lithium ion batteries that can be charged very rapidly without adverse effects, generators that produce three-phase power are coming onto the market. These units can produce enough power to charge (through a special charger) a set of lithium batteries in a faction of the time single-phase power can do the same job. Standard appliances don’t like three-phase power, however. A number of smaller generators offer a three-phase option. Another option most of the manufacturers are now making available is a generator with Direct Current (DC) output. These units produce battery-charging power for vessels using an inverter to produce AC current from an onboard battery bank. Any skipper who is considering adding a new generator to his boat should spend some time determining exactly what his electrical load is likely to be. All electrical appliances have the power requirements listed on the nameplate or electric motor. The power requirement will be listed in watts. When on full, electric heaters, refrigerators and freezers usually require 1,500 watts—to run them all at the same time will take 4.5kW. Don’t forget about a microwave, electric cooktop, water heater, and electronics. After all appliances and systems are examined and the skipper factors in how the electrical system will be used, the total power requirements will be determined and a decision on the type and size of generator can be made. Kohler Power Systems has a Mobile Paralleling Box, which delivers cutting-edge flexibility by allowing users to combine different sized generators with different fuel types. The paralleling box is specifically designed for use with Kohler’s gaseous and diesel mobile generator line. The technology was launched during the 2015 PGA Championship. This product will bring unmatched flexibility and a new level of customization to a wide variety of applications – including large scale, world-renowned events like the PGA golf tournament. The Mobile Paralleling Box, along with a fleet of Kohler generators, allows users to mix and match different size generators to meet job requirements. Four of the new boxes can be used to parallel as many as eight generators. The Kohler Decision-Maker 3500 digital controller, which is standard on all Kohler gaseous and Tier 4 Final diesel mobile generators, provides the paralleling intelligence and network communications for remote monitoring. Any Kohler mobile generator with the Decision-Maker 3500 digital controller will work with the Mobile Paralleling Box. The digital controller along with the Mobile Paralleling Box makes it possible to parallel generators for applications such as using multiple smaller units to replace a larger generator, providing redundancy to a primary generator in support of critical loads, meeting system capacity demands when one generator is inadequate, or managing generators to be sequenced on or off in a predetermined order based on system output. The new system uses contactors to connect to the bus and eliminates the need for installing or investing in motorized breakers on generators that may never be used in a parallel application. Each contactor is rated at 1,000 amps – different sized generators can parallel as long as each unit’s output is less than 1,000 amps. The advantage of the paralleling system is that it removes the need to size circuit breakers to specific generator output. Color-coded camlocks for input and output feeds make the new box easy to setup and maintain while unused camlock connectors are protected with lockable security bars. The system also includes two 25-foot control cables as well as lockable storage for control cables. During the PGA Championship, the Mobile Paralleling Box was used to provide power redundancy for Kohler Co. hospitality tents. A Kohler 175REOZT4 Tier 4 Final diesel unit was used as the primary power source and a Kohler 125REZGT – an EPA-certified gaseous unit that runs on LP – served as a secondary power source. Paralleling intelligence is incorporated into the Kohler Decision-Maker 3500 digital controller, which provides system monitoring and diagnostics while also offering a user-friendly display. The advanced digital controller uses a patented hybrid voltage regulator and unique software logic to manage alternator thermal overload protection features that normally require additional hardware.